I have accomplished my dream. Now I have no dream. Seconds after the Russians won their first Olympic hockey gold medal since 1992, Pavel Datsyuk couldn’t contain his joy at what he considers the peak of his career. 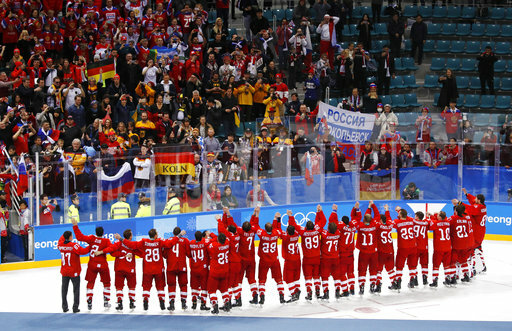 Even though Datsyuk won the Stanley Cup with the Detroit Red Wings in 2002 and 2008, the 39-year-old said capturing gold at the Olympics in his fifth try was his greatest accomplishment, even in a tournament without NHL players and even when called “Team Olympic Athlete From Russia” because of sanctions over state-sponsored doping. Datsyuk, who took home a bronze medal in Salt Lake City in 2002, had six assists to help the Russians capture Pyeongchang gold as captain and one of their best players. "There are a lot of nice feelings now in my heart, but at the same time I can't believe it yet." Datsyuk went home to Russia in the summer of 2016 citing family reasons after putting up 314 goals and 604 assists for 918 points in 953 regular-season games over 14 seasons with the Red Wings. Datsyuk, who was the oldest men’s hockey player in the Olympics, still hasn’t decided whether to retire after this season. He accomplished his dream with the help of Ilya Kovalchuk, who went back to Russia to play in the Kontinental Hockey League despite being just three seasons into a $100 million, 15-year contract with the New Jersey Devils. Kovalchuk had five goals and two assists and was voted tournament MVP. Kovalchuk and Nikita Gusev, who led Russia and the tournament with 12 points including two goals in the gold-medal game, were great. Datsyuk was Russia’s captain and leader.